This is part 2 of a six-part series of guest posts by Tomer Perry, Research Associate at the Edmond J. Safra Center for Ethics, Harvard University. He can be contacted at tperry [at] ethics [dot] harvard [dot] edu. To skirt theoretical controversies and avoid convoluted technicalities, I define game mechanics broadly to cover any game elements that designers use to shape gameplay. Mechanics are ‘tricks of the trade’ – concepts, ideas, principles – ways to organize a game’s rules and players’ interactions to achieve a compelling, engaging and fun experience. Lancaster: bigger knights can take smaller knights. The first and most important concept in designing games and learning activities – the golden rule of game design – is that you want to match the theme with the mechanics. Whatever you have students do as part of their assignment must make sense in terms of the world the assignment is supposed to emulate. The general idea is that actions students make in the classroom have to make sense in the fictional world your exercise creates. 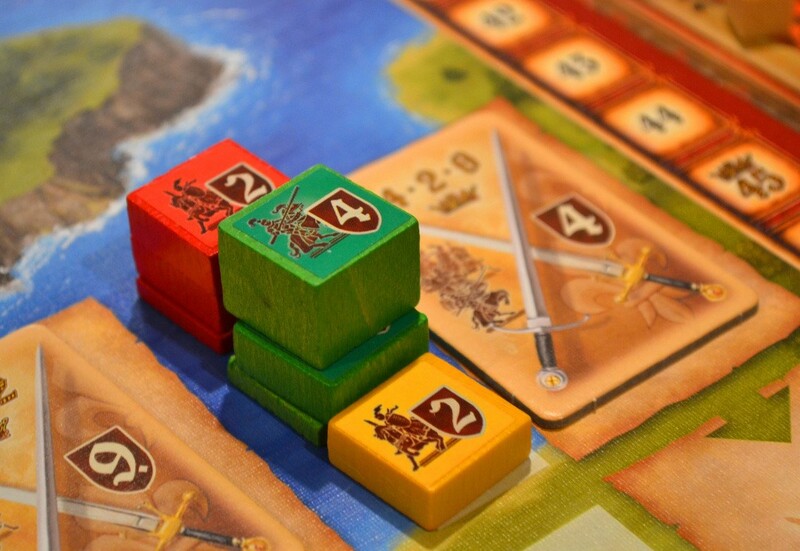 For example, in the board game Lancaster players take turns placing cubes on the board to gain resources. This is typical of a certain genre of games, called worker placement, a famous example of which is a game about farming called Agricola. There is a difference between the two games. In Agricola, when a player places a cube on the spot that produces wheat, no one else can get wheat that turn. This rule makes sense for farming – if someone bought all the wheat in the market, you don’t get any wheat for a while. But in Lancaster, the cubes are knights, and they come in different sizes (marked by numbers) – a knight of size 3 can push over any knight of smaller size, taking their spot at the castle. This simple rule change makes sense because we know knights will push each other while farmers won’t. The rules (‘you can/can’t push people out of spots on the board’) match the story superimposed by the game. This principle is very important in designing simulations. For example, in my campaign management simulation, students work in groups, making decisions regarding their candidate’s political campaign. During the last scenario, one student in each group receives a different prompt that discloses secret information that they alone received: it turns out that their candidate is involved in corruption. While their team deliberates, the lonesome student has to make a decision – do they leak the information at the expanse of their campaign? Students report feeling lonely and stressed about having to make the decision alone, which is exactly the experience of whistleblowers. The rules of the game – giving the scenario to just one student in each group and instructing them to make a decision on their own without sharing it with their group – evokes an emotion that matches the real world story the student has to deal with. Catan: a euphemized version of European colonialism. Another important concept is the Magic Circle. Entering the ‘magic circle’ is accepting the world and rules of the game and it requires some willing suspension of disbelief. 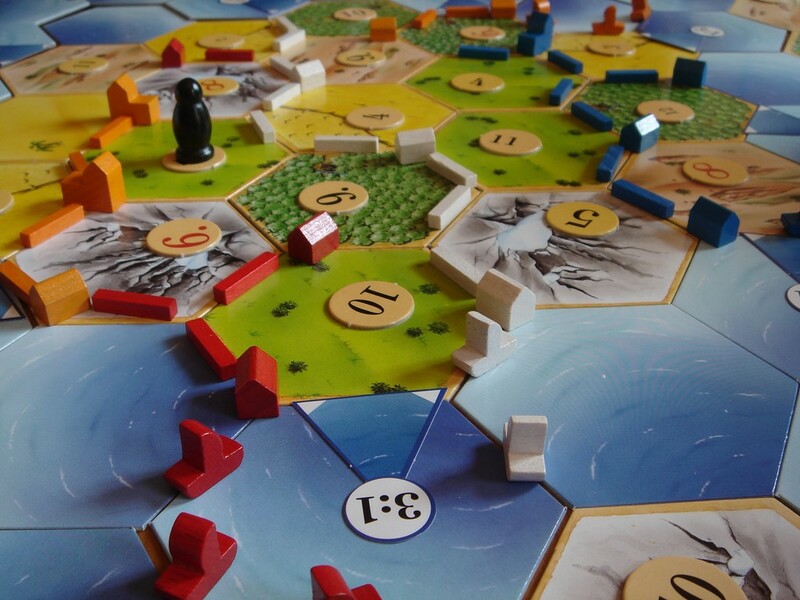 In the successful board game Catan, players accept that they are peaceful colonizers of an empty island where only a single robber runs around taking resources from them – a euphemized version of European colonialism. It’s a completely ridiculous premise, but once you accept it, the game works. Designers try to facilitate players’ transition into the magic circle by delineating clearly the boundaries of the imaginary world and making it appealing. The world you create for your students should be simple enough for them to understand it almost immediately – like the clearly isolated and self-sustaining island of Catan. Likewise, the roles students take on should make sense given the world they are in, and the actions they can do should make sense given their role. Every time a player runs into a contradiction – something that doesn’t make sense – it pushes them a little bit out of the magic circle, eroding their willing suspension of disbelief. If students feel like nothing make sense in the world of your exercise, they lose interest and tune out. The golden rule and the magic circle are two basic ideas of game design that can apply to a variety of learning objectives. If you have any more ideas to add, feel free to add them in the comments. < Previous What do you see?